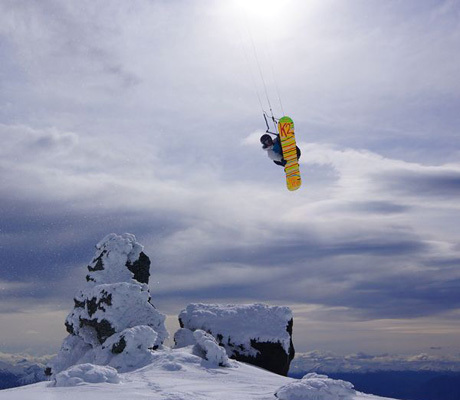 The Ozone Summit is a SUPER snow kite and for experienced flyers only. When Ozone set out to design the Summit snow kite they wanted to give flyers the ultimate fix for SPEED. The Ozone Summit delivers blazing fast turning speeds and a high wind range that is not for the faint of heart. This is not a beginner’s power or snow kite. The Summit’s high aspect ratio sail is still stable during high winds which is usually not the case. The ability to boost high or rocket up hill is always available when you fly the Summit. The Ozone’s Contact-Snow Control Bar System has a huge de-power range which beginners will appreciate and the dual Ronstan Orbit pulley system gives very responsive handling. New for the Contact-Snow bar is the option of two safety systems. One is the Ozone “Megatron Quick Release” and the other is the “Brake Handle System”. The Ozone’s Summit is a new kite on the block and we hope it stays around for a while. Pick one up today and experience the need for speed.